In our 132nd episode, we ask you a very important question about comics, talk about some breaking Brit comic scene news, and play what seems like a lot of music. 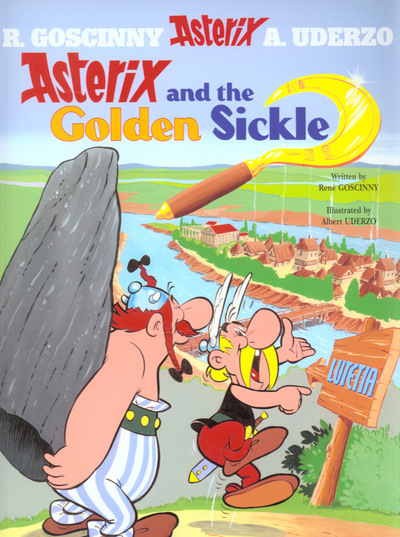 Spotlight: Asterix And The Golden Sickle by Goscinny & Uderzo – buy it here! Outro: The Flaming Lips – buy it here! Extra songs by Michael Georgiou and David Wynne – find Michael here, and David here. 00:41:00 Great Beast – Find out more here! 00:43:00 Hypergirl HC release – Find out more here! 00:48:00 Michael Georgiou on Comiket – Find out more here! 01:08:30 Happy Birthday David – Watch it here! 01:11:00 Listener Question – How do you read your comics? Hey, guys! Thanks for reviewing NEAR DEATH. I just wanted to point out that I’m not in charge of RINGER. I’m on the writing staff, but I didn’t create the show and I’m nowhere near head writer. That would be Eric Charmelo & Nicole Snyder. I’m just happy to be part of it. Near Death is a great comic, so always glad to talk about it! Thanks for clarifying that point about Ringer, sir. I’ve probably got myself confused because you’re the only person on the production that I follow on Twitter. I should clarify that for all I rag on it, Ringer is on the must-watch pile in our house – I draw a comparison between it and 24 because they both satisfy similar immediate-pleasure-requirements, sacrificing just enough plausibility in the name of suspense and surprises. Also, cheers for adding the song! I was inspired by Dave and the awesomeness of Comiket. Thanks for the heads up, sir! Stupid Comcast! Video removed. You almost certainly have something there.